Welcome to Ski-Esta! a luxury rental home designed for large, extended family vacations, located in the beautiful mountains of the Sunday River area of Maine. Whether you come to ski, snowmobile, hike, fish, mountain bike, golf or to enjoy any of the many other year round area activities, our home is the perfect place to experience it all! Book now and enjoy the many resort quality amenities that we have to offer: Swim in our indoor heated pool with built in spa; relax in 3 multi-person steam rooms; dry off in the Finnish Sauna; watch a movie in a cinema quality home theater room; enjoy our Chef' Dream Kitchen with its 60' Wolf Dual Fuel range; seat 40+ people in our dining room and kitchen; Relax in one of three outdoor hot tubs -- one on our 50ft. roof deck; enjoy the main deck fire pit; play pool or ping pong in our game room; 2 offices with full computer, fax, and wireless internet; 14 pair boot dryer; dog shower. Book Now! This spectacular home will exceed your expectations! Construction Completion Details: Interior Finish Details: Each bedroom has custom made/designed bedding and window treatments. All of the furniture was purchased either from specialty retailers and craftsmen or in High Point, North Carolina -- the furniture capital of the USA. The house features a number of custom built-ins -- two window seats, sleeping platforms, entertainment units, cabinets, mud-room seating, ski-pegs, hat/mitten/boot shelving, bay window seat, etc. The design work in the flooring in every room is outstanding and unlike anything you have every seen before. The magnificent arched timber trusses and the one of a kind 40 foot masonry fireplace are truly unique. The central staircase is mahogany with black iron balusters. There are 7 custom showers (slate, travertine, marble, granite, glass, onyx, pebbles) including a slate mosaic and copper pencil dog shower!. The kitchen will not only please your family chef but may very well earn a feature magazine spread. No expense has been spared in making this the ultimate retreat! Our Commitment to our Guests: We have been helping extended family groups make memories and solidify bonds that will last a lifetime. Our homes are geared to facilitating an unforgettable vacation experience for large family groups. They are uniquely designed to provide ample space for everyone to gather, cook, dine, etc. as well as a private space for each family that they can retreat to. Amusement for kids (both young and old) as well as toys and gadgets for the adults make our homes a place that you don't really need to leave in order to find relaxation and entertainment. Our homes are also a special place for couples that have chosen them as the location for their family wedding. We our proud that over the years, over 30 couples have started their married lives in our vacation homes. In addition to hosting large family groups in our homes for the last 13 years, we too vacation with up to seven families every year and put our homes through the same paces that you will. You will be amazed at what we offer! Full bathrooms are en-suite with the bedrooms. There is also a full bathroom with changing room and toilet room for the pool house as well as a full bathroom with a steam shower and corner jacuzzi tub for the lower level. Half baths are beautifully decorated and situated close to common areas so that your personal bathroom remains that way. The dog shower is beautifully tiled in copper pencil, slate mosaic, and porcelain -- conveniently located near the mud room entry to provide a place to wash off your pet, hose off your cooler, boots, or anything else that needs to be washed. The main floor powder room is equipped with the Toto neo rest toilet which features a heated seat, auto flush and close, and various bidet options. Bedroom vanities all feature granite tops and are decorated to complement the adjacent room decor. Full view of Sunday River's 8 interconnected peaks! Majestic views of the mountains from all vantage points! (3) Four dishwashers in total: 2 in the main kitchen, one in the lower level kitchen, and one in the rec room kitchenette. (3) Two 28.5 cubic foot side by side refrigerators, one 18 cubic foot refrigerator in the rec room kitchenette, and two under counter beverage refrigerators in the main kitchen. (2) Top Level kitchen has 60' dual fuel range, 60' kohler Pro sink, built in Meile coffee machine, two additional prep/bar sinks, 2 Dishwashers, two under counter refrigerators, Robo Coupe food processor, commercial quality blenders, etc. Lower level kitchen is fully equipped with 28.5 cubic foot refrigerator, stove, microwave, Dishwasher and many other extras. Over 4,000 square feet of outdoor living space -- roof top deck! The house has two full kitchens and one kitchenette. The main kitchen has professional quality equipment and everything necessary to cook for the large extended family groups the house is geared towards. In addition to the TV's in every bedroom and the large TV's in the rec room and great rooms, the house also has a full cinema/theater room for viewing movies. The indoor pool is heated, has a built in spa/whirlpool, has a waterfall, a resting ledge in the deep end, a toddlers ledge for the little tykes, and, most importantly, an automatic safety cover that adults can engage when the pool is not in use. All the floors in the house have radiant heat (including the pool house) for maximum comfort. Near the pool is a resort sized steam room and a resort sized dry sauna, complete with copper bucket and ladle! The home has four laundry rooms, a 14 pair boot dryer, 36 cubbies, coat hooks galore, ski pegs in the garage as well as a ski waxing/tuning bench. Nintendo Wii and Guitar Hero! For the past 2 years I've had the pleasure of using Skiesta as a venue for a couples retreat! Skiesta is truly amazing! All of the bedrooms are beautiful, each with its own comfortable bathroom, which is a huge plus! The view of the mountains and ski slopes are absolutely breath taking! Everyone had plenty of space to 'be around' or to 'be alone'. Great amount of space in the home. We have friends who also coordinate retreats here and they love it as well! Sophia was wonderful to work with and we look forward to our next stay to celebrate our anniversary in 5 yrs!! The house was absolutely beautiful, the view was spectacular and the amenities of the house are wonderful!! We just wish we stayed longer then 4 days to enjoy everything more! The web site was very accurate in describing the house. In reality the house was nicer than the web site portrayed. We would definitely recommend the property. Sophia and everyone at Ski-Esta are so friendly and helpful. The home is incredibly beautiful and the views are amazing! I would recommend this home to anyone and will be back again. SkiEsta provided the perfect venue for our weekend wedding! Between more formal wedding events at SkiEsta where our guests all raved about the home, our close family and wedding party staying at the house were able to enjoy the amenities of the house: a ping pong table, billiards room, movie theater (or sports theater to watch the world series! ), a gorgeous and perfectly heated indoor pool, sauna and steam room, and multiple outdoor hot tubs. Sophia, the owner, was very easy to work with and provided quick response times and was very helpful in answering any questions about the venue and the surrounding area. The views over Sunday River from SkiEsta are spectacular! My new husband and I hope to rent SkiEsta again in the future for an anniversary trip or family reunion. I don't see how this house could possibly disappoint! It is fabulous! SkiEsta is the most fabulous rental property! For our wedding weekend, it served as the perfect venue for multiple wedding events and everyone who came to the property was in awe of how beautiful it was. Between more formal events of the weekend like the rehearsal dinner, the wedding itself and the survivor brunch, our close friends and immediate families enjoyed the amenities SkiEsta has to offer, including the movie room (or sports viewing room - for the World Series games!) the billiards table, the ping pong table, the beautiful indoor swimming pool warmed to the perfect temperature for swimming, and three outdoor hot tubs! The views over Sunday River and the mountains are absolutely breathtaking and SkiEsta was a dream vacation spot and wedding venue. I hope to return someday for an anniversary trip/family reunion! In addition to the home itself, Sophia, the owner of the property, is so easy to work with in terms of booking and answering any questions. We had nothing go wrong during our stay, but I have complete confidence Sophia would be available and helpful during the course of your stay if you needed any assistance with the home. What a perfect and luxurious getaway home! 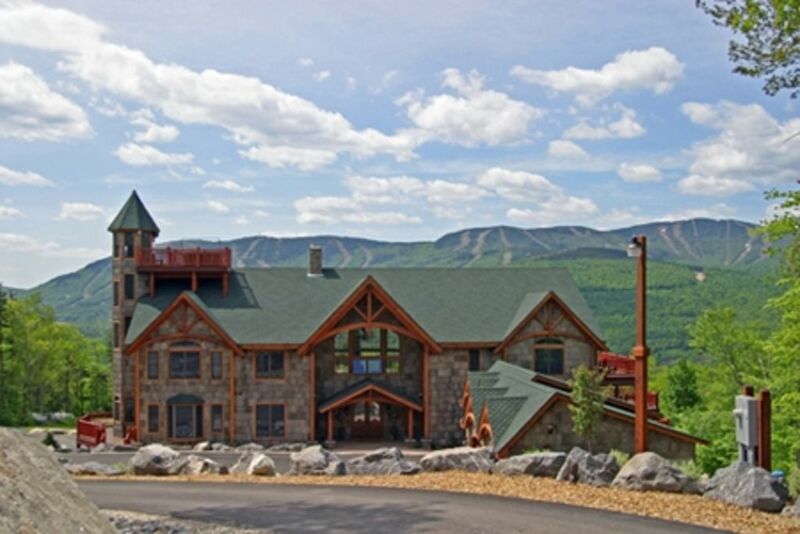 The house is located across the valley from the Sunday River Ski Area -- less than a five minute drive. Make a left onto Sunday River Rd. from Route 2 at the Brew Pub, follow Sunday River Rd. to the first fork in the road -- bear right towards the covered bridge, continue along Sunday River rd to the second fork in the road -- bear right again, pass the covered bridge on your left and then make your first right onto Douglass Rd., then make your second left onto Keystone Drive, your first left onto Steamboat Drive, and then your first left onto Powder Ridge Rd. We are the first house on the right at the top of the cul de sac. At the moment, we are the only home on the cul de sac. Our property is 4.45 acres and is located next to Timber lands on one side and an empty lot on the other. Golf: The Sunday River Area is home to two fabulous golf courses: The Sunday River Golf Club and The Bethel Inn Resort Golf Course. The Sunday River Golf Club was completed in 2005 and has won recognition as one of the best courses around: Golf Digest -- Top Ten Best New Upscale Public Courses; Travel + Leisure Golf -- Top Ten Best New Courses in the World; Golfweek -- #1 Course in Maine; GolfStyles New England -- Public Course of the Year. The Bethel Inn Golf Course is a 6,663 yard, par 72 course that was originally built in 1913 and redesigned in 1988: America's Greatest Golf Resorts magazine -- Top Ten Courses in the Northeast; Golf Digest -- 3 1/2 stars; the course is home to New England PGA Fall Festival Pro-Am and the New England Couples Tournament. Holiday weekends are 3 nights at the weekend rate. Special events where you expect to host an event where guests in excess of the stated occupancy of the home will be in attendance shall incur a special event fee of either $600 plus tax or $1200 plus tax depending on the number of guests you will be hosting.